Kids will appreciate attractions like Keoladeo National Park and ISKCON Vrindavan. Get a sense of the local culture at Agra Fort and Mother Teresa's Missionaries of Charity. Go for a jaunt from Agra to Vrindavan to see Prem Mandir - Shyama Shyam Dham about 1h 40 min away. The adventure continues: relax and rejuvenate at some of the top local wellness centers, contemplate in the serene atmosphere at Gurudwara Guru ka Tal, admire the landmark architecture of Jama Masjid, and don't miss a visit to Taj Mahal. To see reviews, maps, photos, and other tourist information, go to the Agra route builder site . In December, plan for daily highs up to 74°F, and evening lows to 47°F. Wrap up your sightseeing on the 27th (Thu) early enough to travel back home. On the 28th (Fri), admire the striking features of Rashtrapati Bhavan, then take a stroll through Hauz Khas Village, then take a peaceful walk through Jahanpanah City Forest, and finally admire the natural beauty at Humayun's Tomb. On the 29th (Sat), you'll have a packed day of sightseeing: steep yourself in history at India Gate, then meet the residents at National Zoological Park of Delhi, and then contemplate the long history of Red Fort (Lal Quila). 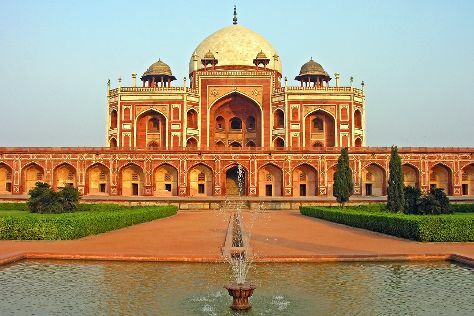 For where to stay, other places to visit, reviews, and other tourist information, use the New Delhi itinerary builder . You can drive from Agra to New Delhi in 3 hours. Other options are to take a train; or take a bus. In December, daytime highs in New Delhi are 74°F, while nighttime lows are 48°F. Wrap up your sightseeing by early afternoon on the 30th (Sun) to allow enough time to drive back home.